This week I had the privilege of sharing more bushcraft with Austin Caviness, host of “Austin Outdoors” featured on WXII channel 12 out of Winston Salem, NC. 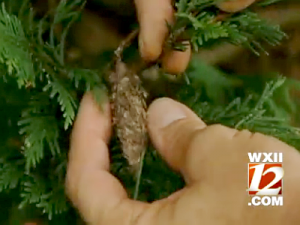 The topic of this segment was finding and using bagworms for fishing bait. Bagworms are often found on evergreen plants such as juniper and cypress. They weave a cocoon that incorporates bits of surrounding foliage and are almost perfectly camouflaged. As those bits begin to die, they turn brown and stand out among the green surroundings. The earlier they are discovered, the better. The cocoons’ season usually begins in May and ends late June. The cocoon is surprisingly tough and pretty much has to be cut open in order to get the grub inside. So, next season if you notice these cocoons in your trees or bushes, don’t think “pests”, think “bait”. Click HERE to see the online video. This entry was tagged Austin, Austin Caviness, Bagworms, Bait, Fishing, Worms, WXII, WXII12. Bookmark the permalink.